2. Which type of VLAN is used to designate which traffic is untagged when crossing a trunk port? 4. What must the network administrator do to remove Fast Ethernet port fa0/1 from VLAN 2 and assign it to VLAN 3? 5. When a Cisco switch receives untagged frames on a 802.1Q trunk port, which VLAN ID is the traffic switched to by default? 6. Port Fa0/11 on a switch is assigned to VLAN 30. If the command no switchport access vlan 30 is entered on the Fa0/11 interface, what will happen? 7. Which command is used to remove only VLAN 20 from a switch? 8. What happens to a port that is associated with VLAN 10 when the administrator deletes VLAN 10 from the switch? 10. A Cisco switch currently allows traffic tagged with VLANs 10 and 20 across trunk port Fa0/5. What is the effect of issuing a switchport trunk allowed vlan 30 command on Fa0/5? 11. Refer to the exhibit. PC-A and PC-B are both in VLAN 60. PC-A is unable to communicate with PC-B. What is the problem? 12. Refer to the exhibit. DLS1 is connected to another switch, DLS2, via a trunk link. A host that is connected to DLS1 is not able to communicate to a host that is connected to DLS2, even though they are both in VLAN 99. Which command should be added to Fa0/1 on DLS1 to correct the problem? 13. What is a characteristic of legacy inter-VLAN routing? 14. What is a disadvantage of using router-on-a-stick inter-VLAN routing? 15. Refer to the exhibit. Router RA receives a packet with a source address of 192.168.1.35 and a destination address of 192.168.1.85. What will the router do with this packet? 16. Refer to the exhibit. In what switch mode should port G0/1 be assigned if Cisco best practices are being used? 17. A small college uses VLAN 10 for the classroom network and VLAN 20 for the office network. What is needed to enable communication between these two VLANs while using legacy inter-VLAN routing? 18. Refer to the exhibit. A network administrator needs to configure router-on-a-stick for the networks that are shown. How many subinterfaces will have to be created on the router if each VLAN that is shown is to be routed and each VLAN has its own subinterface? 19. 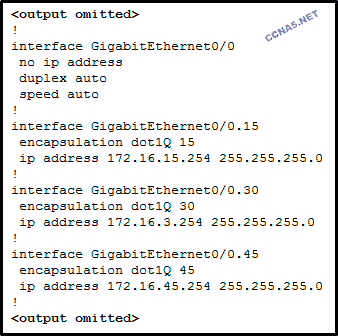 When configuring a router as part of a router-on-a-stick inter-VLAN routing topology, where should the IP address be assigned? 20. A high school uses VLAN15 for the laboratory network and VLAN30 for the faculty network. What is required to enable communication between these two VLANs while using the router-on-a-stick approach? 23. Fill in the blank. Use the full command syntax. The show vlan command displays the VLAN assignment for all ports as well as the existing VLANs on the switch. 24. Open the PT Activity. Perform the tasks in the activity instructions and then answer the question. ( ) Configure the interface as an IEEE 802.1Q trunk. 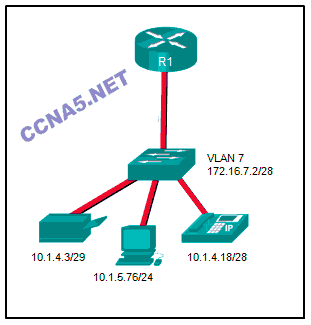 ( ) Assign a data VLAN to the switch port. (x) Add a voice VLAN. (x) Assign the voice VLAN to the switch port. ( ) Activate spanning-tree PortFast on the interface. 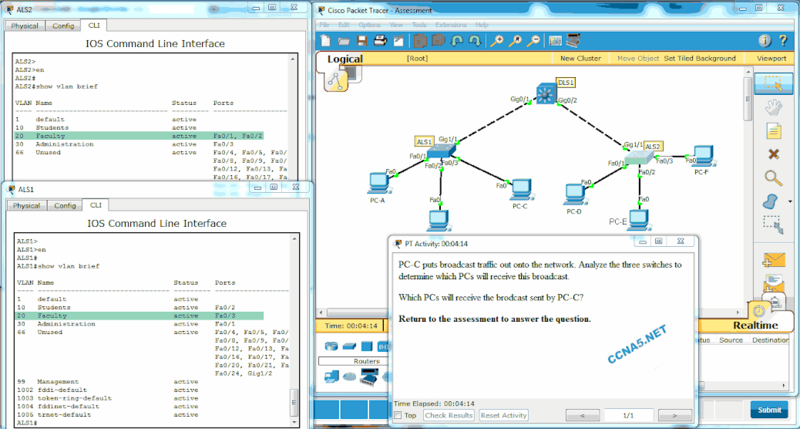 ( ) Configure the switch port interface with subinterfaces. (x) Configure the switch port in access mode.